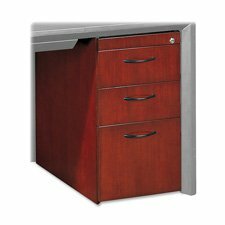 Features Ideal for installation underneath a credenza or return. Veneer surface is protected with two final coats of high-tech catalyzed lacquer Drawer interiors finished to match Locking drawers operate smoothly using full-extension ball-bearing suspensions Gang-lock features removable core Two box drawers and one file drawer, accommodating letter or legal file folders Dimensions: 15W x 18D x 27H Weight: 62 lbs . Available Finishes: Sierra Cherry on Cherry Veneer Mahogany on Walnut Veneer .